A woman who pleaded guilty to animal cruelty has been sentenced in what Bransby Horses described as one of the most ‘shocking cases of neglect they had ever seen’. Rebecca McEvoy, of Leicestershire, received a suspended sentence from Leicester Crown Court of four weeks imprisonment; suspended for 12 months with a rehabilitation activity requirement for up to a maximum of 20 days. McEvoy was ordered to pay an £80.00 victim surcharge, £250.00 costs to the RSPCA and was also disqualified from keeping horses for five years. In January 2016, the RSPCA responded to a call at an address near Newark, Nottinghamshire. 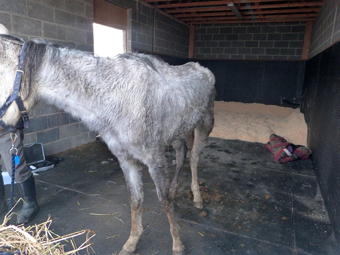 Following additional assistance from local equine welfare and rescue charity, Bransby Horses, and Lincolnshire Police, five Arab horses were removed from appalling conditions. Said RSPCA Inspector, Daniel Bradshaw: “On arrival at the address I found one collapsed horse in a stable surrounded by three others in poor condition. The collapsed horse was extremely thin and appeared to be near to death. “In a second stable, a fifth emaciated horse was discovered with a lice infestation and large abscess under her front leg. The two stables which the five Arabs were housed in were extremely dirty, damp and dark. Water was available but no food or clean bedding was present. Following their rescue, the five horses have been cared for by Bransby Horses who provided specialist veterinary treatment and round the clock care, costing the charity tens of thousands of pounds. Now legally owned by the charity, the five horses will be rehomed and continue to receive correct care and attention. 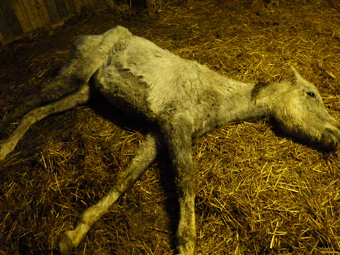 Said Ryan Rouse, Bransby Horses’ Head of External Welfare: “This rescue was one of the most shocking cases of neglect our team had ever seen and it took months to nurse the horses back to full health.